The 2 Rivers Ceramic Studio is a fully equipped cooperative studio with facilities for the independent clay artist. The goal of the studio is to provide a professional working atmosphere for ceramic artists of all abilities. A 40-cubic-feet gas-fired reduction kiln is the centerpiece of the studio. 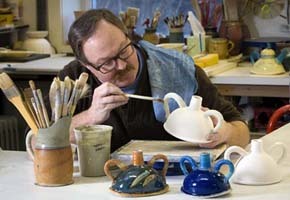 There are a variety of evening and daytime classes for adult students wishing to pursue the clay arts at a variety of levels, from beginner to advanced.